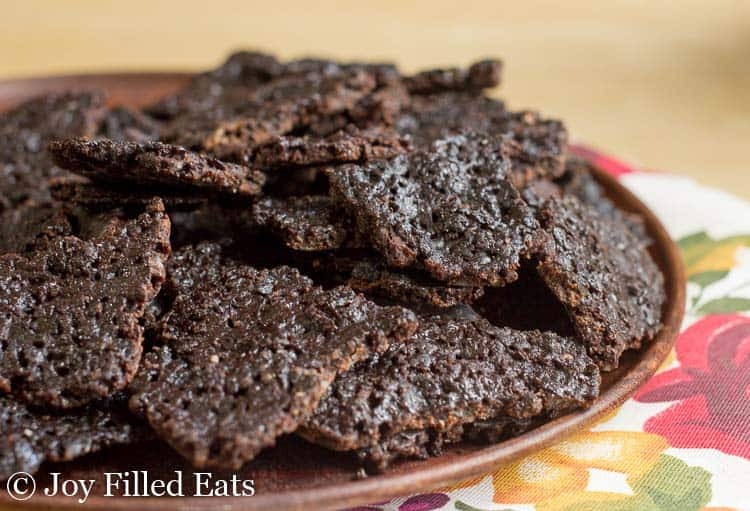 Oh, brownie brittle. 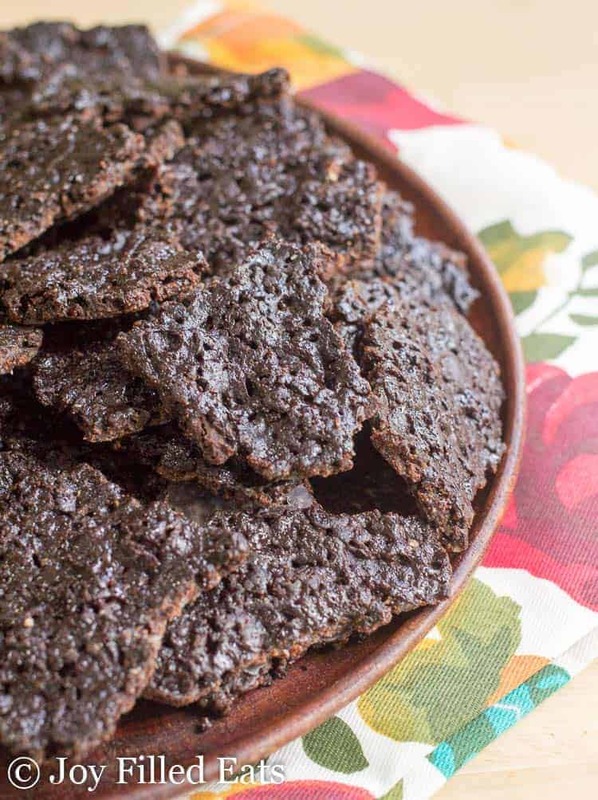 That crunchy, chewy, decadent treat is on the menu once again with my Keto Brownie Brittle Recipe. 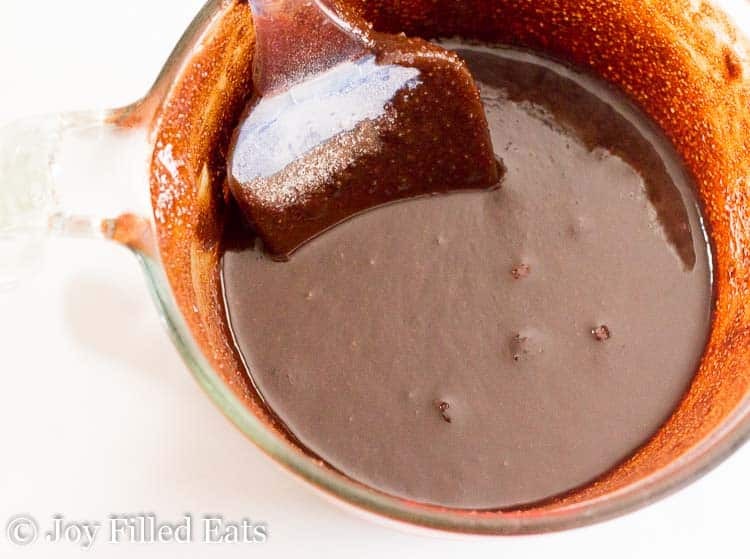 This recipe is as easy as melting some chocolate and mixing a handful of ingredients into it. I made this brownie brittle over a month ago and this was a top choice when I polled readers to see which recipe I should post next. But with moving in less than 2 weeks, sleep-away summer camp for the whole family (we volunteer), and my brother-in-law’s wedding I’m just getting around to it now. I really hope it was worth the wait. Thanks for your patience! It can be tricky to get recipes with alternative flours to crisp up. I’ve found that using gelatin as a binding agent instead of eggs helps create crisper baked goods. However, even with that trick, this brownie brittle really needs to be stored in the fridge or freezer. I love it right from the freezer on a hot day. After I made it I stuck the tray in my deep freeze and every time I went down to the basement to move over the laundry I would sneak a piece as payment. Laundry should always come with brownie brittle, am I right or am I right? I normally melt my chocolate in the microwave. As long as you go slowly and stir frequently you shouldn’t burn it. I do 45 seconds, stir, 30 seconds, stir, and then repeat if needed. Once it is 75% melted just keep stirring and the last pieces should melt. 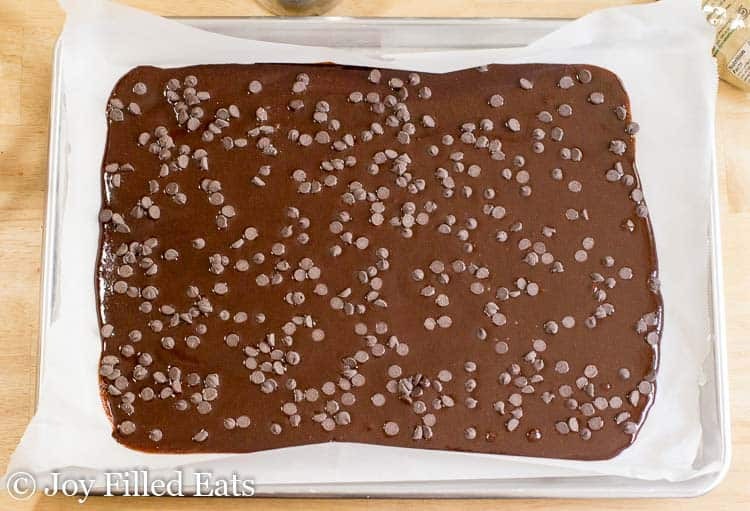 You can use chocolate chips in the first part of the recipe when you melt the chocolate or use a chocolate bar for both. Chocolate is chocolate. You just want to use a sugar-free or very dark chocolate without a lot of added sugar. 85% dark chocolate has only a few carbs and a true sugar-free chocolate has even less. I recommend keeping this in the fridge or freezer. If you let it come to room temperature it gets a little softer and less brittle like. This is a super simple recipe. 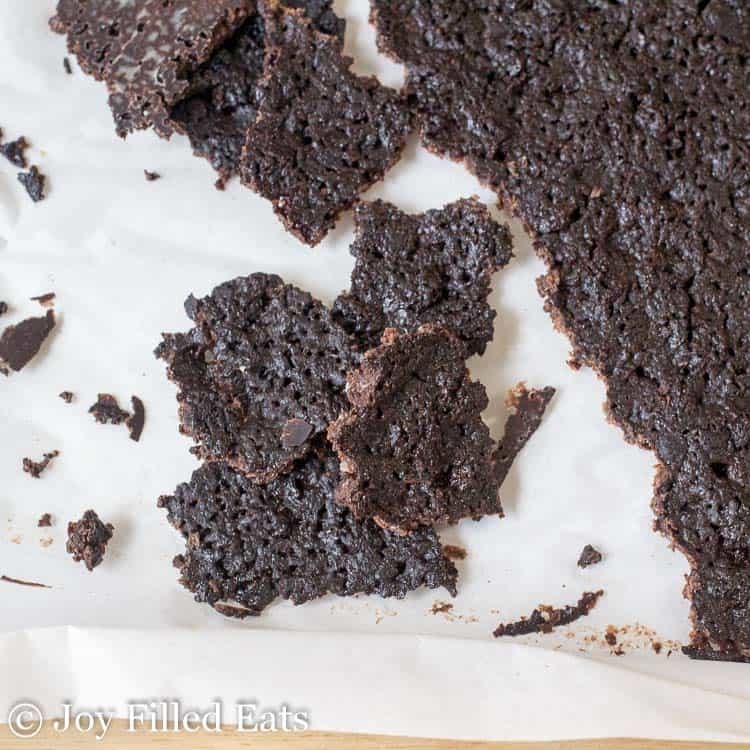 The only trick to this brownie brittle recipe comes in baking it. You want it to cook until it is well done but not burnt. 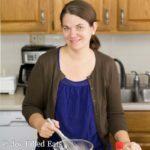 I hope you enjoy my Keto Brownie Brittle Recipe! Let me know what you think in the comments. 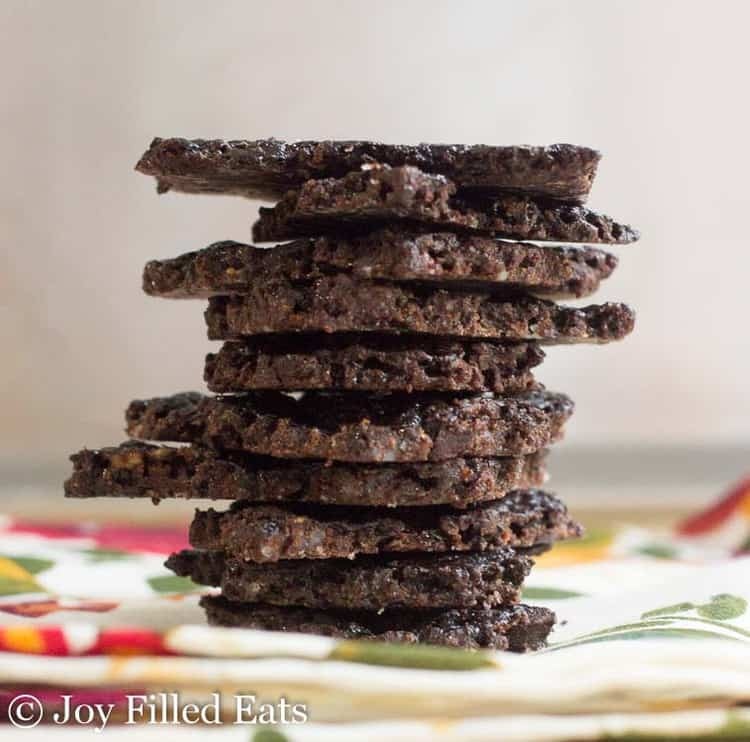 Oh, brownie brittle. 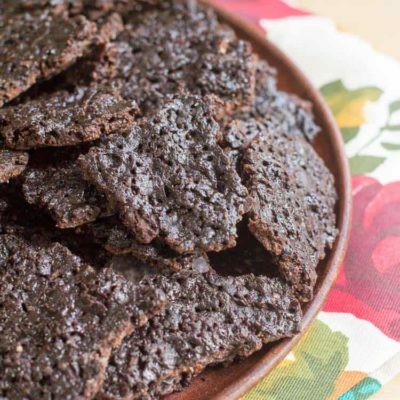 That crunchy, chewy, decadent treat is on the menu once again with my Keto Brownie Brittle Recipe. Preheat oven to 350. Line a large 11x14 cookie sheet with parchment paper. Melt the butter and chocolate in the microwave, microwaving for 30-second intervals and stirring after each. Stir in the sweetener, almond flour, gelatin, vanilla, and salt. Spread on the prepared sheet. It should be about 1/4 to 1/2 inch thick. Sprinkle with the chocolate chips. Bake for 25-30 minutes. Cool completely and then chill for at least 2 hours in the fridge or freezer. Break into pieces. Store in the fridge or freezer. Hi! We just made these. Are they supposed to crisp more in the fridge? They are a bit chewy. I am not sure if they are supposed to be crisp or not. They have a really great taste though! The butter absorbs back into the brittle as it cools. When you chill it it will set. This could be one of the recipes super sweet won't work for but I think you just need to chill the brownie brittle. I love how recipe mistakes often end up turning into something amazing and brilliant! (saw your comment about a gal who was making your brownies and forgot the eggs which led to this recipe). Thanks for sharing!!! :) I have LOVED all of the recipes of yours that I've made! On nutrition information, it doesn't say what the serving size is. 1/12 of the recipe. You can cut it into squares if you want exact portions. HI! I think I have made these before and they are amazing! We now have a lactose intolerant member of the family. Do you think coconut oil would work in place of the butter? Thanks so much for sharing such wonderful recipes!! Yes, coconut oil should work. Use refined or butter flavored to avoid a coconut taste. That's a great idea, Debbie! I have a no bake chocolate crust but not a baked chocolate crust. I'm going to try it too! Hi Marva, maybe. Eggs make for softer, cakier baked goods when using alternative flours. When I want crisper cookies I leave out the eggs and use gelatin. Using eggs might make these less brittle-like. I have no gelatin is there something I could substitute or just leave it out? It works as a binding agent since these do not have eggs. I'm not sure they would work without it. Hi there. I'm not sure that this has worked for me and I wonder if the quantity of butter is correct because mine has turned out wet and oily. I actually used less butter than the recipe states (12 American tbsps being 180ml and I used only 136 grams) plus I used 1/2 cup coconut sugar which made the uncooked mix plenty sweet and only 1/3 cup chocolate chips. Should I maybe have increased the almond flour since I decreased the sweetener? Any other idea where I might have gone wrong or why I have an oily butter slick on top of the slice? This looks amazing and I really want to get it right. Thank you. Hi Annette, changing the sweetener to coconut sugar might have caused that but the butter may resabsorb as it cools. I would try and increase the almond flour next time. I am allergic to almonds, what flour should I use? I have not tested this recipe with any other flours, sorry. A different nut flour might work. Or sunflower seed flour. Yes. But you can always make your own. Just melt unsweetened chocolate and add sweetener. Just made these last night. I tried them this morning and they are AMAZING!! 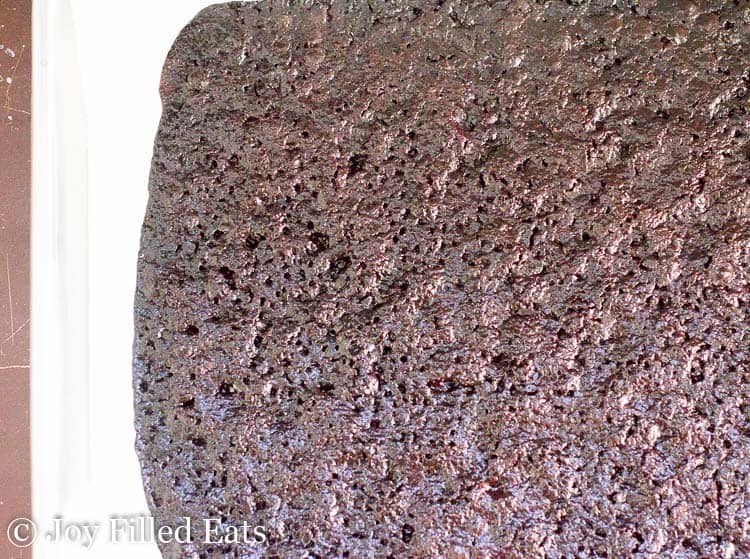 The gelatin sort of gives it a chewable tootsie roll texture. Delicious!! !